…as a kid growing up and shuffling through various public schools, i was exposed to the same urban myths and lurid stories that appealed to the morbidity of thirteen year olds. bloody mary, chupacabra’s, the night stalker and so forth peppered our conversations like trained mccaws repeat oft heard phrases. 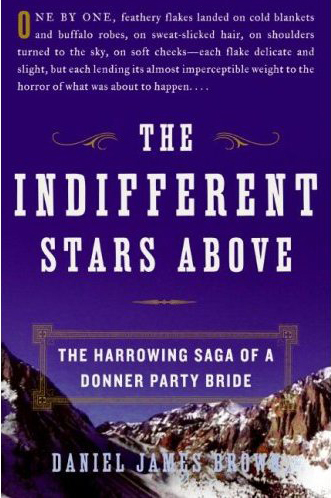 of course the donner party tragedy was bandied about hollowly, all speculation but no real facts behind it. just wildly distorted “truths” passed on from older siblings, a distracted parent or an irritated teacher. what i knew of the donner party was simple: they got lost, snowed in and began to eat each other. end of story. fast forward thirty years and without it even being on my mind, i manage to find a book that reveals so much about the tragedy and the forces that put it into play. written by daniel james brown, “the indifferent stars above” comes across with so much heart. the author didn’t set about writing another dry, factoid chronology and nor did he attempt to write some creepy historical novel replete with fictional dialog. instead he chose a young woman from the party close in age to his own daughter and full of the dreams of starting a new life with a loving young husband in the bargain. he traced sarah graves from her home in illinois and sketched out a picture full of life, family and community which breathed life into a young bride who would in the end, withstand the horrors of the donner tragedy. tragedy doesn’t begin to do justice for these series of events which were doomed from the very beginning. rather than list all of the gory details, he introduces the characters who take advantage of the donners, the graves and other emigrants and who through their own greed and gross negligence, seal their doom. he speaks about the mountain men and trappers who lent their help to so many lost emigrants and he describes the native american tribes who were exploited and exploited others in turn. throughout the recounting gleaned from historical reference and old fashioned sleuthing, brown weaves in medical information, historical comparisons and relevant facts to give the story a context to which we can relate. this in turn enables the reader to better understand the hard, often brutal circumstances, the cultural and psychological traits, durability, strengths and frailties of the individuals involved. i was riveted! what i took away was the perspective their experience put my own life into. it was definitely a look into an extinct way of life that nothing in the modern western civilization could prepare you for. we are surrounded by so many creature comforts and conveniences, our modern plumbing, gps, computers, internet, medicines and so forth that have cocooned us in selfish narcissism. i believe the author said it best as he contrasted the stark reality of what was happening to sarah and the rest of the donner party with the industrial revolution and then modern advances that were happening on the east coast. he said that basically, the further the party went west, the further back in time they traveled leaving behind all of the modern conveniences that were transpiring in civilized cities. that their situation and the tools at their disposal was in comparison to the stone age. what really stung was knowing that so much of it could have been prevented but for the predatory greed of others and their own naïvete. that said, of course the gory details were fascinating too! every five to ten minutes i kept interrupting my partner with groans of “oh no!” and “oh, my god”. at every turn it seemed that whatever you thought was bad could be topped with something worse. i’ve never seen so many disasters compounded and by the end of course, i’m wondering why they had to go all the way out to california in the first place when things were just swell in illinois. you’d have to know a thing or two about the pioneer spirit but for most of us, that means backpacking through vietnam or a holiday trek through india. the one thing that i can attest to, having worked in a morgue, was the comment on the smell of cooked human flesh. for those who turn up their noses and exclaim, ‘i could never’, i can attest to the fact that it does indeed smell like any other juicy roast or charbroiled burger you may have consumed during your lifetime. a comparison so certain that finally turned me to vegetarianism. A very thoughtful and emotive review – perhaps a little flowery but one can forgive the fact knowing the materials drama!! Good job Janene! Loved it and was fascinated by the Donner story myself…even visited the place when I was a kid. It was a statue/memorial of some sort…my memory escapes me. Okay and you had me laughing on you’re “cooked meat” comment! Charbroiled?? LOL!